The statMethods blog contains articles about data analysis, statistics, and graphics, with an emphasis on the R language. I started to learn R about 5 years ago. Since I learn best by teaching, I developed a website with a set of tutorials designed to get people up and running with R quickly, and named it (not surprisingly) Quick-R. The site has become quite popular and I continue to maintain and update it. Based on a number of requests for a hard copy version of the site, I then took two years (that seemed like ten years) to write a book that would take the material, expand the range and depth of the topics covered, and add more examples. 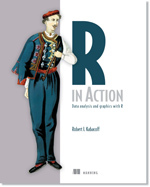 The book is named R in Action: Data analysis and Graphics with R, and has finally been published. This is a very good thing for my marriage. Finally, I created this blog so that I would have a platform to discuss topics from both Quick-R and R in Action, give more examples, respond to questions, and explore new methods.